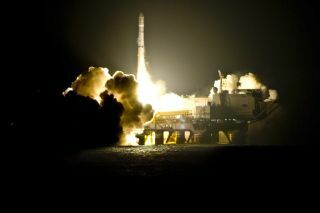 A Sea Launch Zenit 3SLB rocket lifts off with the Sicral 1B satellite from the Odyssey Launch Platform in the equatorial waters of the Pacific Ocean early on April 20, 2009. PARIS - Major commercial satellite fleetoperators said the June 22 Chapter 11 bankruptcy filing by Sea Launch Co. LLCis bad news for the health of the industry despite repeated claims by somelaunch service providers that theglobal market is oversupplied with rockets. Industry officials said that whilethe oversupply situation often detailed by Arianespace Chief ExecutiveJean-Yves Le Gall and International Launch Services (ILS) President FrankMcKenna is technically true, it is often at variance with the market’s day-to-dayreality. Adding up the raw numbers forlaunchers based in the United States, Russia, Europe, Japan, China and India doessuggest that too many launch vehicles are chasing too few commercial customers— one reason why some commercialrocket operators have never generated much profit.But the two principal U.S. rockets, Atlasand Delta, have in effect removed themselves from the market to focus on more profitable U.S. government business. China’sLong March vehicle, which has demonstrated its technical reliability in thepast decade, continues to be subject to a de facto ban from the commercialmarket because of a U.S. policy prohibiting U.S.-built satellites and satellitecomponents from being shipped to China. Japan’s H-2A rocket cannotlift the heavier commercial telecommunications satellites and in any event is restrictedto limited launch periods each year. India’s rockets have won somecommercial business, but it will not be until the upgraded GeostationarySatellite Launch Vehicle has been flying regularly before itcan attract the bulk of the commercial market,which is to launch satellites weighing more than 4,000 kilograms each intogeostationary transfer orbit. Similarly, Space Exploration Technologies ofHawthorne, Calif., is positioning its futureFalcon 9 vehicle for the commercial market, but the market is stillawaiting the rocket’s first flight. The result has been that, for manycommercial satellite competitions, it is only Reston, Va.-based ILS, theArianespace consortium of Evry, France, and Long Beach, Calif.-based Sea Launchthat are able to field a serious bid. RomainBausch, chairman of SES of Luxembourg, the world’s largest commercialsatellite operator in terms of annual revenue, has said launch-serviceavailability remains the single biggest near-term threat to the stability ofthe satellite telecommunications industry. DavidMcGlade, chief executive of Intelsat of Bermuda and Washington, thesecond-largest commercial operator, has made similar comments and recently wasobliged to pay Sea Launch’s Russian partners additional cash to assure thatpreviously contracted launches would actually occur. McGlade has defended themove, which has trimmed Intelsat’s earnings this year, as being necessaryto maintain a robust launch services sector. Giuliano Berretta, chief executiveof Eutelsat of Paris, has gone out of his way to stimulate the market entry ofnew launch services suppliers. Eutelsat was thefirst operator to use the Lockheed Martin Atlas 5 and Boeing Delta 4 rockets,placing commercial telecommunications satellites on both vehicles’inaugural flights in 2002. Morerecently, Eutelsat has booked a 2010 launch with China’s Long March, sayingthe Chinese have made the kind of schedule guarantees that other launchproviders cannot make. Asked to comment specifically on theSea Launch bankruptcy filing, satellite operators all said they assume SeaLaunch will find a way to emerge from the process and continue operations. ChristopherMcLaughlin, spokesman for London-based satellite operator Inmarsat, said thecompany relied on Sea Launch in late 2005 to launch the second Inmarsat 4satellite after Inmarsat could not find suitable launch dates from ILS andArianespace. “Wewere very happy to have them there and available for us,” McLaughlinsaid. Eutelsatspokeswoman Vanessa O’Connor said Eutelsat seeks to maintain the widestpossible supplier base among launch service providers. “Thathas always been our policy,” she said. Feltes wasreferring to French President Nicolas Sarkozy’s June 20 statement duringthe Paris Air Show that urged European governmentsto begin, in 2011, design of a rocket to succeed Ariane 5. But arecent French government report for French Prime Minister Francois Fillonconcluded that the successor to today’s Ariane 5 rocket should limititself to carrying one 6,000-kilogram satellite at a time into orbit. AfterAriane 5, the report concludes, Arianespace should seek to perform only theminimum number of commercial launches needed to sustain the rocket’sreliability for the European governments who will pay for its development.Seeking commercial market share above that, the report concludes, is not worththe investment.